This is the new and improved Hiblow HP100LL. This new design includes improvements for longer lasting diaphragms over the standard HP-100 model. The Hiblow HP-100LL fits many 600 & 750 Gallon Per Day units as well as several other 500 gallon per day aerobic systems. The Hiblow HP-100LL is a compatible replacement for the Gast SPP-100, Thomas 5100, Medo LA-100, Secoh EL-100, and many other 100 LPM units. This model includes an attached alarm to signal air pump failure. This air pump is brand new and as a part of our Whale of a Deal program has a 2 Year Warranty! The Hiblow HP-100LL is used on some 500 GPD and 750 GPD rated NSF Class 1 Standard 40 aerobic treatment systems (ATUs). 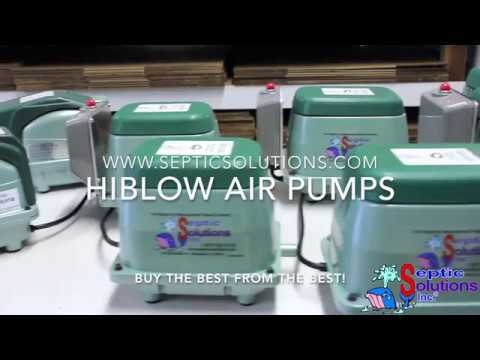 The Hiblow linear diaphragm septic air pumps are widely regarded as the highest quality and longest lasting septic air pumps available on the market. They are extremely quiet and very energy efficient. The Hiblow HP-100LL can be used for septic tank aeration as well as an aerator for small ponds and water gardens. The new Hiblow HP-100LL is an improved long life version of the Hiblow HP-100. The original Hiblow HP-100 would average around 2-3 years of diaphragm life. This new and improved Long Life version should see around 5 years out of diaphragms in most applications. A common misconception is that the air pump just puts air in the water, so it doesn’t really matter which size is used. Nothing could be further from the truth. Air pump sizing is actually very important to the operation of your system, and not every system will use the same size air pump. If you have been our website, then you already know there are many different types and sizes. The air pump size is normally determined by the volume capacity of the tank, the style of air diffusers in the tank, and how many GPD (Gallons Per Day) the system is designed to treat. Our sales team can make sure you get the right size pump if you are unsure about this aspect of buying a new one. In most cases we only need either the model number of the pump you are replacing, or the brand of your aerobic system and the GPD that it is rated to treat. Again, size does matter and it is very important that you get the correct air pump for your system.